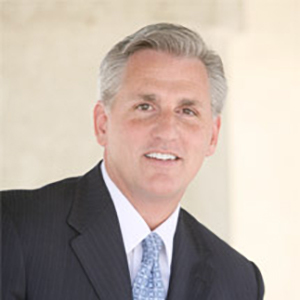 Congressman Kevin McCarthy proudly serves California’s 23rd district and is currently the Majority Leader in the U.S. House of Representatives. Kevin was first elected to Congress in 2006 and is a native of Bakersfield and a fourth-generation Kern County resident. The grandson of a cattle rancher and the son of a firefighter, Kevin grew up in a working-class family and is committed to preserving and promoting the American dream for hardworking Americans. At the age of 21, Kevin started his own small business, Kevin O’s Deli, from the ground up. As he worked hard, hired employees, and enjoyed success in his community, he soon learned—as all small business owners do—that the margins are thin, the hours are long, and that often Sacramento and Washington are obstacles, not aids, to success. The redundant and frivolous rules along with tedious paperwork and overburdening taxes compelled Kevin to enter public service. He sold his business to put himself through college and graduate school at California State University, Bakersfield. While at school, he interned for Congressman Bill Thomas and later became a member of Congressman Thomas’s staff. In 2000, he won his first public election as Trustee to the Kern Community College District and then, in 2002, he was elected to represent the 32nd Assembly District in the California State Assembly. As a freshman legislator, he was selected unanimously by his Republican colleagues to serve as the Assembly Republican Leader, becoming the first freshman legislator and the first legislator from Kern County to assume this top post in the California Legislature. Kevin worked with his colleagues in the Assembly and Senate and with the Governor to reduce California’s budget deficit, overhaul the state workers’ compensation system, and enhance California’s business climate to create more opportunities for California workers and businesses. After he was elected to Congress in 2006, Kevin quickly became Chief Deputy Whip and later served as Majority Whip. In 2014, he was elected Majority Leader of the House, where he now leads Congress in fighting for individual liberty, an efficient and effective government, free markets, and a vibrant civil society. Since Kevin was elected to Congress, he and his Republican colleagues have blocked the largest tax increase in American history, cut out-of-control government spending, passed bills to create jobs, promoted North American energy independence, and fought to free Americans from the meddlesome influence of Washington in health care and beyond. Kevin will continue to fight for a strong, fiscally responsible, and free America where every person has the ability to achieve the American dream. When Kevin is not in Washington working for the constituents of California’s 23rd District and for the future of America, he is home in Bakersfield with his wife Judy and two children Connor and Meghan.